Rio Estates is a very small new home development. As you can see from the picture below there are only 29 homes in the entire development. This new home development is going to sell out quick. If you happen to be looking for a newly built home near Olive and 97th Avenue then you are going to have to act fast. 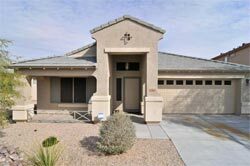 DR Horton is a good home builder and the homes available here are typical mid sized homes for the area. You aren't going to see any large homes, but you aren't going to see any typical starter homes around 1,200 square feet either. Located near 97th Avenue and Olive. 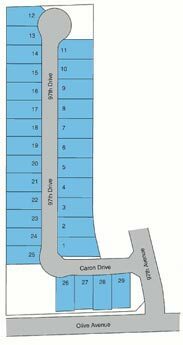 There are 29 new home lots. 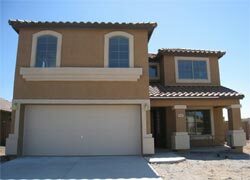 New home builders change prices often so please visit Rio Estates for current pricing. The homes range in size from 1,527 - 2,149 square feet. The builder is DR Horton. Families living Rio Estates are in the Peoria Unified School District. The links below will take you to the individual school's report card which indicates its status under the federal No Child Left Behind Act. Basically these reports can be used as a high level overview as to whether the entire school is performing well or not. Historically the Peoria Unified School District has been a top performer. (No artist renditions here. I am out looking at new homes constantly. 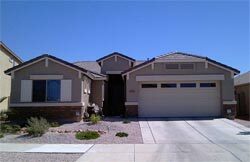 Remember that you need to bring a Peoria Arizona Realtor with you on your first visit to this new home community if you would like someone to represent your interests through the home buying process with the new home builder. Since it doesn't cost you anything to hire a Realtor give me a call and let's go take a look at these homes.